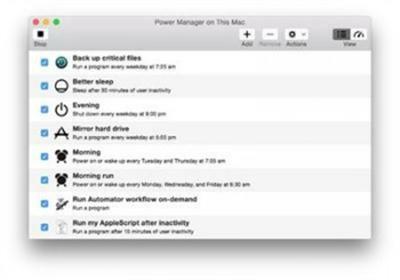 Power Manager is the solution for reducing the energy costs of Mac computers. Use Power Manager to assert control over when your Macs are available and when they are switched off. Power Manager extends the scheduling functionality provided by OS X?s Energy Saver. Unlike Energy Saver, Power Manager is aware of multiple users, offers unrestricted schedules, provides greater customisation, and supports a wider range of actions. Power Manager provides a full AppleScript dictionary for scripting. Power Manager can also perform AppleScripts as part of an event. Automator actions are included as standard. Automator workflows can be performed as part of an event. Our pmctl tool provides complete control over Power Manager. The graphical user interface synchronises and updates immediately as command line settings are issued. Integration with other tools is easy with the Power Manager framework. You can even create your own interface or tools. Connect to and manage Power Manager using your iOS device. Power Manager Remote works over the cellular or WiFi network. Create your events and schedule without needing to write a configuration file or use the command line. The command line is available but optional. Make sure your events get the user?s attention. Pending events count down in the menubar. A notification provides ample warning giving users a chance to prepare or respond. Keep track of your schedule with the status menu. Performing, pending, and on-demand events are always close by. Quickly create events using the Schedule Assistant?s task-orientated approach. Build on events using the advanced editor. Create with the Schedule Assistant, then customise with the Event Editor. Power Manager is computer centric. Multiple users can log in and out without affecting your schedule. Works even when no-one is logged in. Power Manager integrates into Mac OS X?s authentication and authorization infrastructure. By default, only administrators can create or change schedules. Power Manager supports IPv4 and IPv6 with all network traffic encrypted with SSL/TLS. Bonjour support makes remote access easy. Need inspiration? Over 70 recipes provide step-by-step guides to creating events and doing more with Power Manager. Refined: Simplified code that supported legacy operating systems. Refined: Self-signed SSL/TSL certificates now signed with ?sha256'; replaces ?sha1'. Refined: New internal broadcast module replacing CFNotificationCenter. API: Deprecated some SSL/TLS allowances in ?ssl.allow?.